Chicken marinated in spices and honey, grilled over charcoal, served with peanut sauce. Barbecued pork ribs marinated in honey. 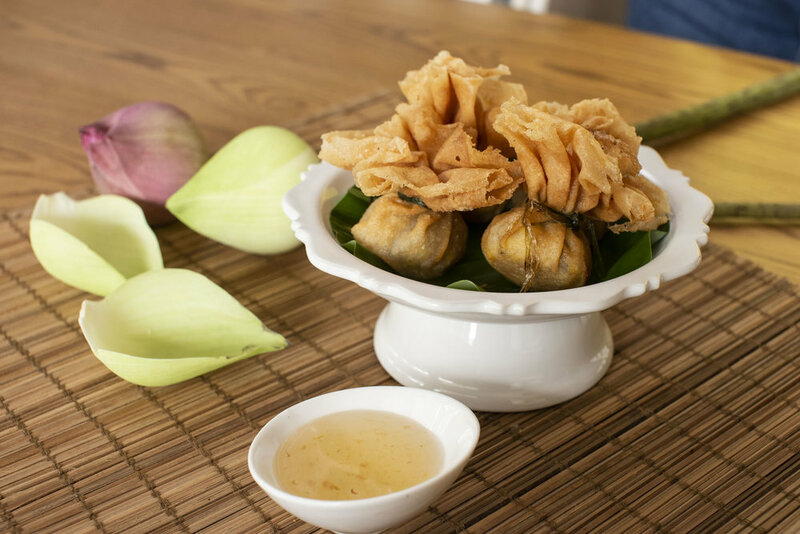 Streamed minced pork dumplings and crab meat, topped with fried garlic, served with sweet soy sauce. Crispy spring rolls filled with shredded roasted duck and vegetables, served with dark soy sauce and plum sauce. Deep-fried mixed vegetables wrapped in rice pastry, served with sweet and sour plum sauce. Deep-fried a mixture of minced prawns, coriander and pepper, spread on French bread, served with sweet and sour plum sauce. Homemade chicken curry puff pastry. Crispy fried wonton with minced chicken, served with sweet and sour plum sauce. Deep-fried mozzarella and spinach wonton, served with plum sauce. Minced fish, mild red curry paste, green beans and lime leaves shaped by hand and fried, served with crushed peanut in sweet chilli sauce. Deep-fried marinated prawns in a light batter, served with sweet and sour plum sauce. Squid, tossed in seasoned flour, flash fried and served sprinkled with spring onions and chillies. A selection of our classic starters - Chicken Sateh, Spring Rolls, Prawn Toast Supreme, Prawn Tempura and Grilled Spare Ribs. A platter of assorted seafoods and vegetables, deep-fried in a light batter, served with sweet chilli sauce. Vegetarian spring rolls, served with sweet and sour plum sauce. Baby corn wrapped in rice pastry, crispy fried and served with sweet and sour plum sauce. Deep-fried sweet corn blended in red curry paste, served with sweet and sour plum sauce. Deep fried mixed vegetables in a light batter, served with sweet and sour plum sauce. A platter of assorted vegetarian starters. YUM NEUA - BEEF SALAD - Thinly sliced grilled beef seasoned with chillies, chopped onions and lemon juice. Thinly sliced grilled beef seasoned with chillies, chopped onions and lemon juice. Transparent noodles combined with spring onions, onions, prawns, chillies, lemon juice and minced chicken. Spicy mixed seafood salad with chillies, lemon juice, lemon grass and coriander. Thinly sliced grilled marinated duck, tossed with spicy salad dressing. Favourite Thai hot and sour soup seasoned with lemon grass, chillies, lemon juice and galangal. Spicy hot and sour lemon grass soup in light coconut milk with chicken or mixed seafood. Spicy hot and sour soup with mixed seafood, flavoured with lemon grass, galangal, chillies and lemon juice. Spicy hot and sour lemon grass soup in light coconut milk with roasted duck. Hot and sour lemon grass soup with mushrooms. Hot and sour lemon grass soup in light coconut milk with mushrooms. The famous thai green curry cooked in coconut milk with an aromatic selection of Thai herbs. The famous Thai curry consisting of red curry paste, kaffir lime leaves and coconut milk. Light and spicy red curry with a selection of Thai herbs and vegetables (without coconut milk). Mild chicken or lamb curry cooked with potatoes in a rich coconut curry sauce. A favourite with all who try it! Your choice of meat stir fried with fresh chillies and Thai Basil leaves. Your choice of either chicken or pork, stir fried with vegetables and sweet and sour sauce. Your choice of meat stir fried with garlic and pepper. Your choice of meat stir fried with red curry paste, fine beans and Kaffir lime leaves. Your choice of meat stir fried with ginger, mushrooms and spring onions. Your choice of meat stir fried with mushrooms, green pepper and spring onions in oyster sauce. Stir fried chicken with cashew nuts and dried chillies. Breast of duck , sliced and grilled then fried with vegetables and Tamarind sauce. Thinly sliced duck, stir fried with ginger, mushrooms and spring onions. Stir fried roasted duck with fresh chillies and Thai herbs. Crispy fried fish, topped with hot chilli and garlic sauce. Crispy fried fish fillet, topped with sweet and sour sauce. Stir fried prawns with vegetables in Thai style sweet and sour sauce. Your choice of either prawn or squid, stir fried with garlic and pepper. Your choice of prawn or squid stir fried with fresh chillies and Thai basil leaves. Stir fried prawns with baby corns, mushrooms and spring onions in soy sauce. Stir fried prawn or squid with Thai style roasted chilli oil. Stir fried prawns with cashew nuts and dried chillies. Stir fried prawns with ginger, mushrooms and spring onions. Stir fried prawns with mushrooms, green pepper and spring onions in oyster sauce. Chicken marinated in garlic, coriander root, coconut milk and rice wine then charcoal grilled, served with sweet chilli sauce. Marinates filet of sirloin beef, grilled over charcoal, served with spicy dipping sauce. Grilled marinated lamb cutlets, served with spicy dipping sauce. King prawns marinated with lemon grass and black pepper sauce, grilled over charcoal, served with chilli sauce and Thai salad. Whole Seabass stuffed with aromatic selection of Thai herbs then grilled over charcoal, served with Thai style chilli sauce. 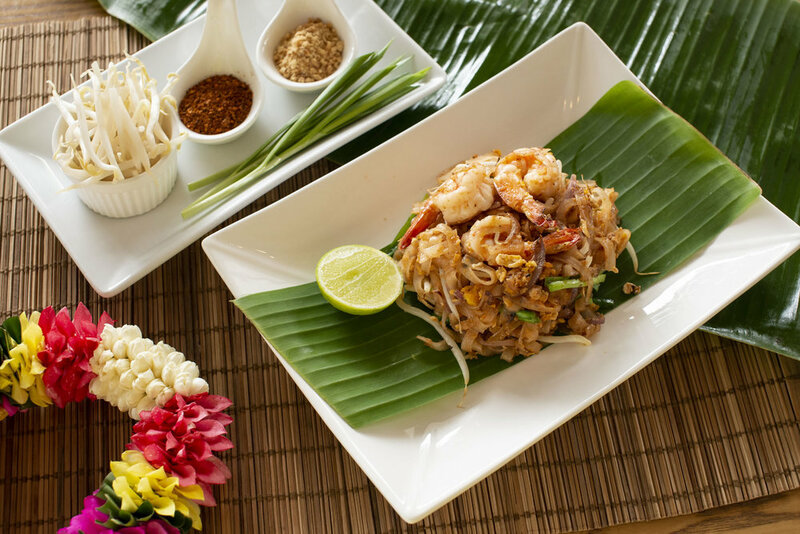 The famous Thai fried noodle with egg, prawns, crushed peanut and beansprouts. Fried rice noodle with egg, prawns, vegetables and soy sauce. Wok fried egg noodle with beansprout and spring onion. Fried rice with shrimps, chicken, raisins, carrot and pineapple. Vermicelli noodle salad with tomatoes, spring onions and flavoured with spicy lime dressing. Steamed mushrooms mixed with lemon juice, carrot, chopped onions, chillies and spring onions. Stir fried mixed vegetables. A good accompaniment to every dish! Stir fried mushrooms with cashew nuts and dried chillies. Stir fried beancurd with fresh chillies and Thai basil leaves. Stir fried beancurd with ginger, mushrooms and spring onions. Beancurd and mushrooms cooked in a red panaeng curry sauce and coconut milk. Mixed vegetables cooked in green curry paste and coconut milk. Thai fried noodle with egg, crushed peanut and bean sprouts. Fried noodles with egg, vegetables and soy sauce. Thinly sliced roasted duck stir fried with our home made red curry paste and aromatic selection of Thai herbs. Stir fried lamb with spicy curry sauce and aromatic selection of Thai herbs and light coconut milk. 3. BLACK PEPPER LAMB - SIZZLING! Lamb sautéed with vegetables in garlic & black pepper sauce, served on a hot plate. Tenderly diced lamb, stir fried with aromatic green curry paste and a variety of Thai herbs. Assorted seafood stir fried with lemon grass and Thai style roasted sweet chilli paste. King prawns sautéed with garlic and black pepper. Grilled jumbo prawns, topped with thick curry cream sauce and a sprinkling of shredded kaffir lime leaves. Crispy soft shell crab sauteed with dried black pepper, coriander root and chopped chillies, A favourite to all Thai! Stir fried jumbo prawns with yellow curry powder and spring onion in light coconut milk. The Royal recipe of lamb slowly braised in our homemade red coconut curry sauce and flavoured with plentiful of Thai herbs and spices. Soft shell crab sautéed with fresh chillies, ginger, mixed Thai herbs and cashew nuts. Classic fish dish!! Deep-fried whole Seabass with green curry spices and coconut milk, infused with traditional Thai herbs.